10 Wacky Products Your Pet Will Love! Some pets are picky and hard-to-please. These pets may refuse even the most popular pet products, but that’s why we love them! Your pet's tastes and proclivities may make them hard to please, but these preferences are what make your pet special. Even eccentric pets need love, so we've compiled this list of wacky pet products that appeal to pets with unusual tastes. 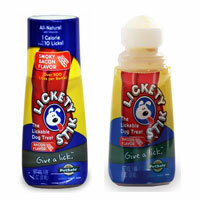 We hope this list helps you find a new favorite toy or treat for your pet! Turn your feline friend into the coolest cat on the block with this spectacularly wacky scratch deck! The Cat DJ Scratching Deck looks just like a real turntable and is made from durable cardboard to satisfy your cat's natural desire to scratch. 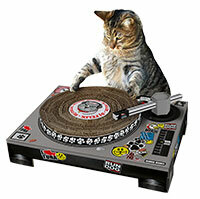 If your cat practices enough, you can even consider investing in a real DJ deck and taking your cat on the road! 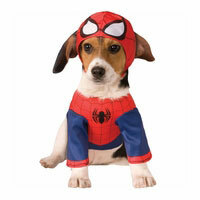 Make your pooch your neighborhood's friendliest Spider-man with this adorable costume from Marvel. Whether you're headed to a Halloween party or simply seeking a disguise to escape the culpability associated with feats of vigilantism, this costume provides the perfect way to turn your pup into a spider... dog... man...? Anyways, it's available in four sizes, so order one for your pet today! Did you ever wonder how much more your dog would love his ball if it was fused with the furry scoundrel that haunts his waking life? 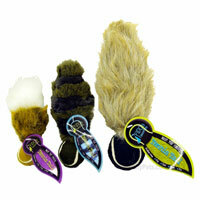 Well, these tennis tails provide the answer by attaching a fuzzy tail to a tough tennis ball. The balls are available in three unique designs so you can select the tail of the animal that he despises the most! The Humunga Stache Ball is a fetch toy that will have your dog looking absolutely fetching! 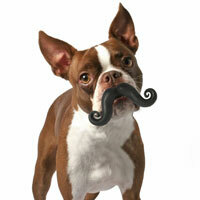 This ridiculous ball toy makes fun time funny by causing your dog to don a dapper moustache. The toy is available in two sizes for dogs of all kinds. If you like the idea of this toy, then you'll also love other Humunaga products, which include balls that give your pet voluptuous lips or a goofy grill. With this unique cigar-shaped catnip toy, you can enjoy drawing parallels between human vices and your cat's predilection for catnip! 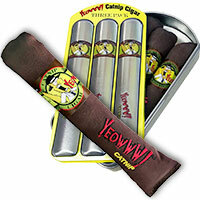 This catnip cigar is made of natural cotton twill wrapped around premium organic catnip! The cigar also features a cigar band with the Yeowww! logo as its insignia to ensure that it looks authentic. If you play your cards right, your cat may even hold the cigar in its mouth in a way that makes it look like he's smoking it! Speaking of drawing parallels between the vices of man and cat- nothing says wacky like an addictive substance that serves to send your feline into untenable fits of madness. Give it a try with these delectable fish flakes today! 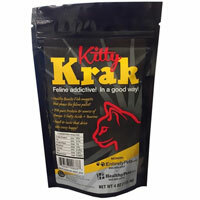 Each flake is carved paper thin and provides a healthy source of both taurine and omega-3 fatty acids, and with these incredible prices- your cat can always afford his fix of these flaky fish treats. Some said that it couldn’t be done. Some still say it’s a crime against nature. But to the naysayers, one can only counter criticisms with cold-hard facts: bacon-by-the-lick is here and it is as real as it is delicious. What’s more is that it’s actually quite healthy at only 1 calorie per 10 licks with all-natural ingredients that provide plenty of nutrients. Who would’ve thought? 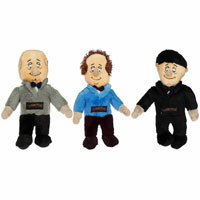 The kings of tomfoolery are back- and they’re here to entertain in the form of talking plush toys! Modeled after the most infamous comedy trio in American history, the hilarious utterances of these toys will fill your pup with a longing for a time he never knew- when talking pictures were simple and everyone experienced them with the same limitations of color perception. Order now! 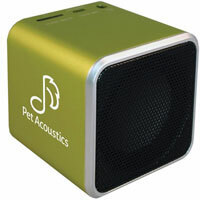 They say to soothe the savage beast with music; and so, why not comfort the domestic cat with calming tunes? These specialized speakers are designed with cats in mind to play pre-loaded pet-specific music that keeps your kitty calm and happy. The bluetooth speakers are also compatible with USB cables and miniature SanDisk cards, so you can upload your own music to add those calming cat tunes you just can’t find elsewhere. Have you ever wondered what it would be like to have a pet hamster? 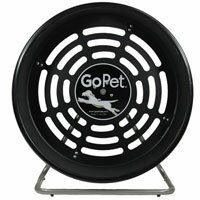 Well, if you have a dog then you can finally find out with the treadwheel from GoPet! This exercise wheel will turn your dog’s humble abode into the quintessential canine crib, complete with all the exercise amenities your dog needs to stay “swole”. This All-American treadwheel needs no electricity to run, so there’s nothing stopping you from making this impulse purchase today! We hope that you and your pet can appreciate these wacky products!